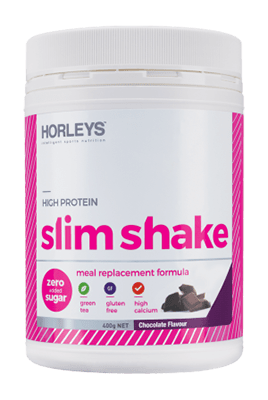 Horleys - Slim Shake. Filling High Protein Meal Replacement. For best results, combine this product with a balanced baseline diet that consists of small, regular meals and an exercise program that has both cardio and resistance (weight training) sessions. You may have up to three servings per day. This product must not be used as a total diet replacement. 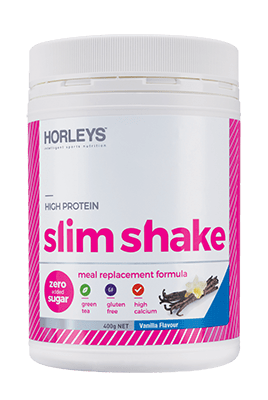 SIZE: Slim Shake is available in a 400g (14 serve) container in two great flavours. Slimshake Protein Blend (whey protein concentrate, skim milk powder, soy protein isolate), Maltodextrin, Inulin, Flavours, Minerals (magnesium phosphate, magnesium oxide, zinc sulphate, ferrous fumarate, potassium iodide), Vitamins (vit. A (beta carotene + vit. A acetate), sodium ascorbate, vit. E acetate, niacin, vit. D, pyridoxine hydrochloride, thiamin hydrochloride, riboflavin, folic acid), Thickener (Xanthan Gum), Sweetener (Sucralose), Green tea extract. If you’re looking to manage your weight, Slim Shake is a great source of protein - nature’s very own metabolic booster and appetite satisfier. Nature’s most complex nutrient, protein happens to be the most useful nutrient for dieting. Although protein has the same basic energy value as carbohydrate, the body responds to protein in a different way. Increasing 'satiety' – protein signals your brain earlier that you’ve eaten enough, and makes you feel full for a longer period, which is great for managing your appetite. Helping you use more energy and boost your metabolism – protein is metabolically expensive, it requires more energy to digest and is more difficult to convert to body fat. Slowing the release of carbohydrates eaten in the same meal to the bloodstream, helping stabilise blood sugar levels over a longer period, improve alertness and minimise food cravings. Protein is also vital in almost every process in your body, and increases the health, but also the shine and look of your hair, skin and nails too – leaving you looking, as well as feeling, great. If you’re on a strict weight loss diet, a meal replacement formulation like SlimShake helps to ensure you get all the necessary nutrients to maintain good health, including protein, that you may otherwise miss out on if you are controlling calorie intake. As part of any effective weight loss plan, we recommend you combine good nutrition with a regular exercise programme. Protein plus exercise increases your muscle tone and boosts your metabolism, meaning you use more energy naturally. Muscle is your very best friend when it comes to weight loss. That’s because the more muscle you have, the more energy your body will burn all the time - even when you’re sitting still. Exercise also releases endorphins that boost your mood and energy levels – leaving you in a more positive frame of mind and better able to enjoy the progress you make. So get moving, and see even greater results! Filling, high protein complete meal replacement. BEST FOR: ideal for active bodies looking to lose or manage weight. Slim Shake is nature's metabolic booster: designed to work with your lifestyle without compromising your energy levels. It is a complete nutrition supplement for weight management, with all the essential vitamins and minerals, and naturally complete proteins from dairy and plant sources to boost metabolism and satisfy appetite.